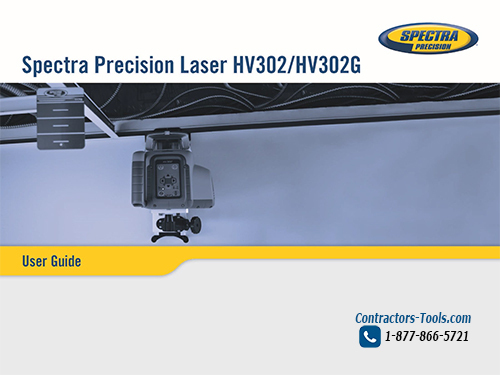 Whether your job is indoors or outdoors, the automatic self-leveling Spectra Precision HV302 Horizontal/Vertical Laser is the most rugged laser available, tough enough to handle a wide variety of horizontal, vertical and plumb applications in both interior and exterior projects. A split beam enables plumb point transfer and 90 degree layout. Even in brightly lit interior conditions, the high visibility beam of the HV302 delivers consistently reliable and accurate performance, enabling you to work faster and smarter. The rugged HV302 laser can withstand drops of up to 3 feet onto concrete and tripod tip-overs up to 5 feet. This strength, combined with full weatherproofing and dustproofing, reduces downtime and lowers repair costs over the life of the product. 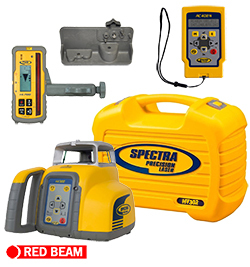 The Spectra RC402N remote control mirrors the basic functionality of the laser keypad and offers additional features using the M and E buttons. 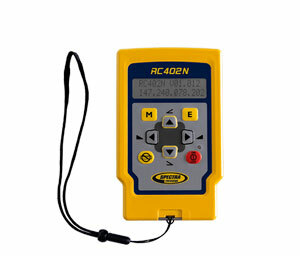 This RC402N Remote allows you to control the laser features and functions up to 330-feet away from the laser. 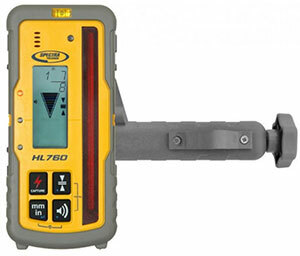 Allowing for one person operation in many jobsite applications. 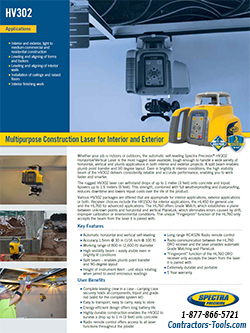 Trimble warrants the HV302 to be free of defects in material and workmanship for a period of five years. Trimble or its authorized service center will repair or replace, at its option, any defective part, or the entire product, for which notice has been given during the warranty period. If required, travel and per diem expenses to and from the place where repairs are made will be charged to the customer at the prevailing rates. 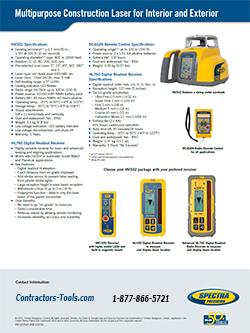 Customers should send the product to Trimble Navigation Ltd. or the nearest authorized service center for warranty repairs or exchange, freight prepaid. Any evidence of negligent, abnormal use, accident, or any attempt to repair the product by other than factory-authorized personnel using Trimble certified or recommended parts, automatically voids the warranty. Special precautions have been taken to ensure the calibration of the laser; however, calibration is not covered by this warranty. Maintenance of the calibration is the responsibility of the user. The foregoing states the entire liability of Trimble regarding the purchase and use of its equipment. Trimble will not be held responsible for any consequential loss or damage of any kind. This warranty is in lieu of all other warranties, except as set forth above, including any implied warranty merchantability of fitness for a particular purpose, are hereby disclaimed. This warranty is in lieu of all other warranties, expressed or implied. We will gladly help you during the warranty process should you have a defective product. Our customers can call 1-877-866-5721 and we will help you locate the nearest service center, along with initial defects and over the counter exchanges that are covered under Trimble's warranty policy.